Kumho Tire USA and the Atlanta Hawks donated an all-expense paid trip to Big Brothers Big Sisters of Metro Atlanta (BBBSMA) in celebration of National Mentoring Month. January was National Mentoring Month, and Big Brothers Big Sisters of Metro Atlanta (BBBSMA) is celebrating those who are already volunteering as mentors, “Bigs,” and also recruiting volunteers. 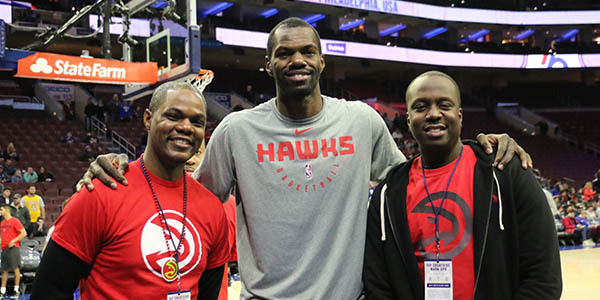 Two dedicated mentors who have gone above and beyond to impact the lives of Atlanta youth were selected to watch the Hawks take on the 76ers in Philadelphia. The selected mentors, Christopher Thomas and Sekou Langevin,e were able to sit courtside during shoot-around and meet Domonique Wilkins and a few current Hawks players. The two, and one additional mentor were also provided with a new set of tires, courtesy of Kumho Tire. On Jan. 21 at the MLK game, the Hawks welcomed 50 bigs and littles to the game versus the Orlando Magic. More than 500 youth in Metro Atlanta are waiting to be matched with a Big Brother or Big Sister. Being a Big means committing to spending a few hours a month with a young person doing things that you love to do — like playing basketball, visiting the library or learning how to cook.